I came across this article today and it touched a nerve, largely because this is a topic I’ve been wrestling with a great deal lately. I’d love to hear some reader feedback on it, honestly…this blog has been around for six years now and it continues to evolve, and in recent months I’ve really grappled with the fine line between sharing myself and sharing my children in a public forum. When I started Less on the Floor in 2010, it was a blog about food. Baby and toddler food, specifically, and the experience of interacting with my then-two-year-old son through food. But it changed, as things do — as I changed and he changed and our family changed. The act of writing was creatively fulfilling and also cathartic, and I expanded my content to explore a much wider breadth of my own personal parenting experience. What’s more, readers really responded to the bigger-picture content. 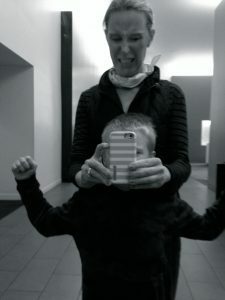 Interestingly, my most successful posts have been the rawest ones, exploring some of the darkest or most confusing moments I’ve had as a parent or as a woman struggling with identity in the face of motherhood. There is catharsis in reading as well as writing: hence the rise of the mommy-blog in our ever-more isolated worlds. You are not alone. For a long time now, I have justified a lot of the more personal content on Less on the Floor on the grounds that I’m writing about my own journey as a mother, not about my children’s respective journeys as, well, children. But the two are deeply, deeply intertwined, and it’s impossible to write about the motherhood journey without invoking my kids. I try very hard not to put words into their mouths or feelings into their brains; I read and re-read every post to be sure that I am sticking to the facts where possible and making it clear that any attempts to see inside their heads (What makes them tick?? No, seriously. I’m asking.) are just that: attempts and conjecture. But I’m not always successful in that. Part of this is because children tend to live on the surface of themselves; they are not yet skilled in the act of feeling one way and acting another. They are impulsive, raw little nerves. Their actions are, more often than not, a direct reflection of their internal lives. And so it happens from time to time that even in sticking to the facts I risk exposing them too much. The other day someone mentioned my blog and LittleMan — who is just getting familiar with computers and the Internet –gasped, Wait, Mommy, you have a BLOG?? What is your blog about? I was nervous to tell him this. I was nervous that he might say, Do you write about me? What do you say? That’s embarrassing! I don’t want you to write that! And then what would I do? I would stop writing about him, of course. And then what would I write about? Could I still write about being a mom, without writing about my kids? I don’t write about being a wife. I don’t write about my marriage, except to give my husband credit as a critical part of this unit. I don’t write much about my profession, my workplace, about my colleagues or my fellow parent volunteers (except the ones who are really good at Pinterest, mostly because I’m jealous). I write about being a mom because it is the singular most seismic assumption of identity that I have ever experienced, but if I’m careful to preserve the privacy of the adults in my world, should I not also be careful with the privacy of the children in it? But the problem is they got older and I didn’t stop writing, and I didn’t confine my writing to back when they were babies and toddlers. This isn’t some nostalgic exercise. I’m writing about the present. I’m putting out there all the silly and embarrassing and challenging foibles that shape our family life, and it’s only a matter of time (like, possibly months, heaven help me) before LittleMan can up and type “my mom’s blog” into Google and read it all. How will he feel about that? With that said, I am going to be making some conscious narrative changes to Less on the Floor. I hope I can retain a lot of what people like about this blog, but I feel an obligation to shift the focus further away from my children and their personal lives. Call it a writer’s challenge: to capture parenthood without really involving the kids too much. As always, I want to thank all of you for reading, for your support and feedback. It’s a vulnerable enterprise and to be honest I wonder sometimes why I do it rather than just keeping a journal or over-sharing on Facebook like a normal human. But six years later, here we are. I can appreciate your problem a bit, Jaime, because I have several years of typewritten journals mainly talking about my feelings about things in my life, job, famlly and family relationships over the years, trips I’ve taken, flights of fancy when I attempted writing fiction (some of it even seems true and sometimes I can’t tell for certain when such things began and ended) political thoughts, spiritual thoughts, reactive feelings toward various issues and incidents –anyway, you get the picture. I’ve not shared these journals with anyone . My problem: what do I do with them now?